Tadano has reported its nine month results, which show revenues up 15 percent for the year, while profits have risen more than 43 percent. Aerial work platforms ¥11.3 billion ($95.3 million). Mobile crane sales in Japan increased 33 percent to ¥29.7 billion ($250.6 million), while exports were up 13 percent to ¥59.9 billion ($505.4 million). Geographically sales for the period – all products – were up 24 percent in Europe, 23.5 percent in North America, 38 percent in South and Central America and 44 percent in Asia, while the Middle East was virtually flat and Australia/Oceania declined almost 19 percent. The company expects the full year to end almost 10 percent up on last year, at ¥198 billion ($1.67 billion), of which mobile cranes will be around 67 percent. It expects pre-tax profits to come in around ¥25.8 billion ($217.7 million). Another solid result from Tadano which is making good progress in sales in North America and parts of Europe. 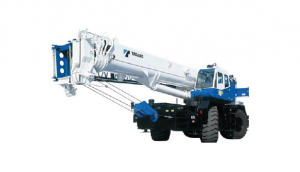 The company is building a solid following for its All Terrains worldwide and its Rough Terrain cranes in the USA where they are gaining an increased following, in spite of strong competition from the well regarded locally built products. Tadano still lags the three other major manufacturers in terms of marketing and distribution, and even brand awareness, but the quality and reliability of its products is winning it a lot of repeat business. This year it is planning a host of new All Terrain cranes, including 70, 100 300 tonne models and possibly a new larger crane, rumoured to be in the 700 tonne region.